A superior quality white margarine with a bake-through butter flavour. Not necessarily of high creaming performance. The fat is based on a blend of selectively hydrogenated edible vegetable oils, which have been fully refined and deoderised. Conforms to both the Muslim and Jewish authority food standards. The margarine has been specifically formulated for the production of cakes and biscuits. Well suited to industrial biscuit production. Also for madeira cakes. 25kg corrugated board container with food grade, low density polyethylene inner liner. The product contains TBHQ antioxidant in accordance with South African legislation. Conforms to both the Jewish and Muslim authority food standards. 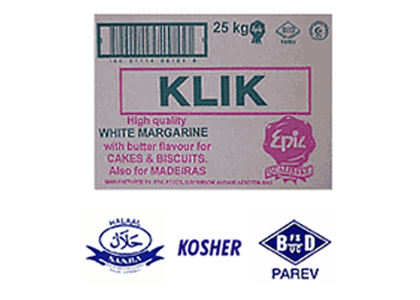 Due to the nature of soft margarines like Klik, the product could "oil out" or undergo changes in texture, when handled in unfavourable conditions. This can be caused by temperature or pressure. It is therefore advised that the product be kept refrigerated (10C max) and the pallets not stored on top of each other.